Welcome to another Global Design Project Color Challenge. GDP129 Colors speak my language! Calypso Coral and Soft Suede are two of my most used and favorite colors! It was so easy to add Pear Pizzazz to the mix! I had yet to use the Climbing Orchid Bundle and the Gift Bag Punch Board so I put them to work for this challenge. With your Stampin’ Trimmer, cut a piece of 12x12 Crumb Cake Cardstock to 12″ x 9″. Using the instructions included with the Gift Bag Punch Board, create the Gift Bag Shown. Ink up the Orchid Flowers, Stems, Leaves and Sentiments in Soft Suede Classic Ink and stamp onto Shimmery White Cardstock. Crop the images (flowers and leaves) with the coordinating dies from the Orchid Builder Framelits Set, using your Big Shot and the Magnetic Platform. Snip out the Stems and Sentiments using your Paper Snips. Color the Orchid Flowers with Calypso Coral Ink and a Blender Pen. Tip: Don’t color in one area too much as it will start to tear the paper. 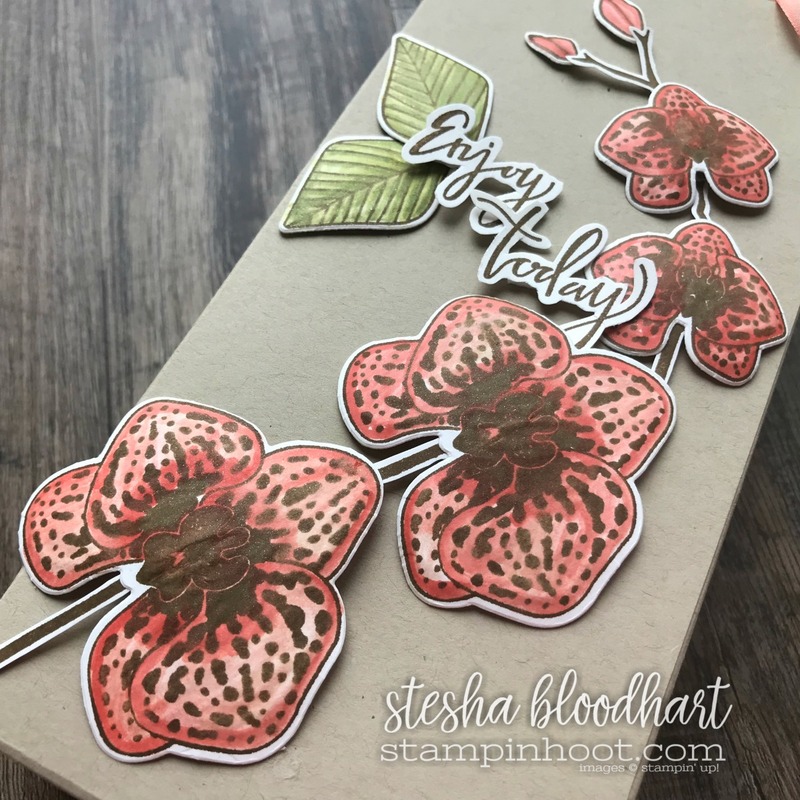 Add dimension to the Flowers and Leaves by flipping the image upside down, placing it on a Stampin’ Pierce Mat and running a Stylus over the centers of the images. Adhere to the Gift Bag, as shown, with Stampin’ Dimensionals. Cut a piece of Calypso Coral Ombre Ribbon to 12 inches and secure with a knot inside the gift bag. (Instructions with the Gift Bag Punch Board). With a Stampin’ Trimmer, cut a piece of Crumb Cake Cardstock to 2 1/2″ x 9″, then score and fold at 4 1/2″. Adhere the Orchids, Stems, Leaves, and Sentiments as shown with Stampin’ Dimensionals. Use an envelope from the Whisper White Narrow Note Cards & Envelopes to tuck the note neatly away for the recipient. The Climbing Orchid Bundle is full of images and beautiful font sentiments that coordinate well. Tip: Not sure what to do with the orchid petal images and branch pieces? Pinterest is your friend! Search for Orchid Flowers and you have oodles of inspiration to create simple or complex works of art. Orchids are one GORGEOUS flower! The Gift Bag Punch Board is a wonderful tool. The instructions are easy to follow and you have endless options for sizing. There are three available options for widths and length can range anywhere from 4″ to 12″! What a great way to create custom coordinating gift bags for your cards. If you haven’t added the Gift Bag Punch Board to your Paper Craft Collection, I highly recommend adding it today! What a beautiful bag! Love that stamp set.